The cat is out of the bag! Bouldering in the Natural State has long been one of South’s best-kept climbing secrets. Since the early 2000s, many climbers have heard of the majestic boulders that line the hills of the Ozarks, but until now the majority of that information was word-of-mouth and kept to a handful of locals. 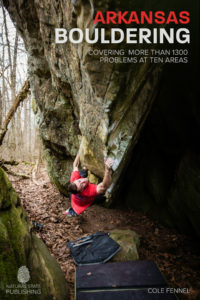 The long-awaited Arkansas Bouldering details ten of Arkansas’s best areas, with thorough problem descriptions, crag directions—including QR codes and GPS coordinates—and professional, full-color photography. This book has all the info and psyche you’ll need to find and send that boulder problem you’ve been hearing so much about.